Sophomore Danielle Hammond scored a team-high 13 points and recorded four blocks and five rebounds. Photo by Shayla Bailey. Women’s Basketball defeated Saint Louis Sunday afternoon 57-47 as sophomore forwards Danielle Hammond and Sydnei Archie combined for 22 points. 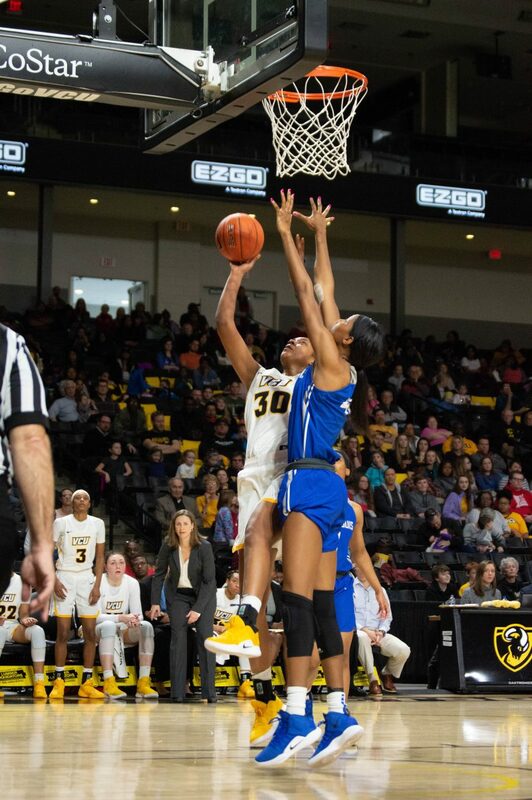 VCU came off a Jan. 23 loss at George Washington, which ended its seven-game win streak. The Rams and Billikens traded buckets to open up the game as Saint Louis’ Ciaja Harbinson struck first and Archie answered with a bucket of her own. Kerri McMahan made two baskets in a row for Saint Louis to put the Billikens up four early in the first quarter. 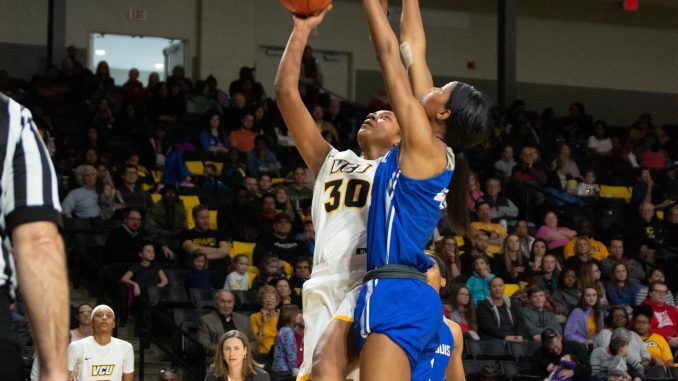 VCU pulled within two when a scoring drought set in for both teams until sophomore guard Taya Robinson made a basket, ending the Rams drought at just over two minutes. Freshman forward Kseniya Malashka broke the tie with a 3-pointer from the top of the key, giving the Rams the lead. 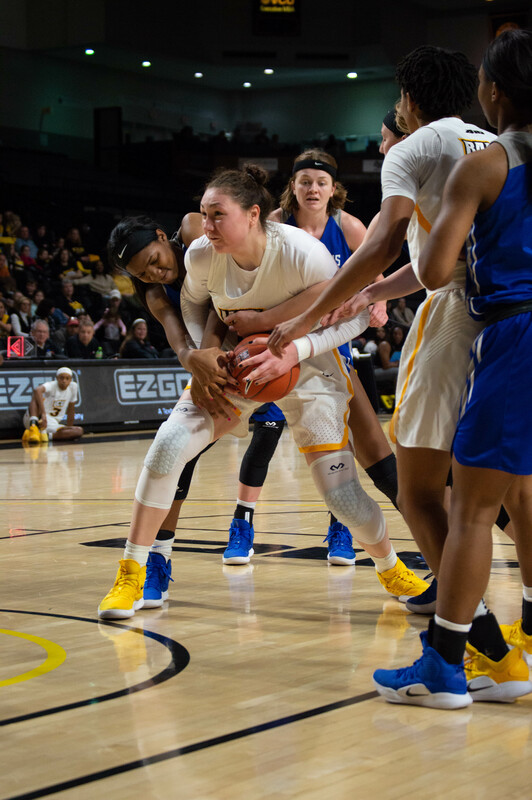 Sophomore center Sofya Pashigoreva helped build the early VCU lead as she accounted for seven points in a row for the Rams, putting the team up six. Pashigoreva finished with seven points, seven rebounds and one steal. Robinson took over in the second quarter, scoring seven points and extending the Rams’ lead to 11. VCU held Saint Louis to shooting 25 percent from the field, including 0-for-3 from beyond the arc. Hammond was a force to be reckoned with in the third quarter as she led the Rams on an 11-0 run to close out the quarter. She accounted for eight of the 11 points, as she went 3-3 from the free throw line during the run. In the fourth quarter, VCU went cold from the field, but got the job done from the free throw line. The Rams closed the game out down the stretch going 9-for-10 in the final quarter from the free-throw line. Archie was a perfect 3-for-3 from the line in the game as VCU combined to shoot 19-for-25 from the stripe.